a plaque placed there during the war and a monument erected in more modern times. 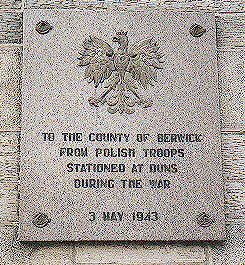 From 1942 the Polish 1st Tank Regiment and 2nd Tank Regiment were stationed at a army camp near Duns. In gardens in the town there exists a stone monument remembering the Polish soldiers. 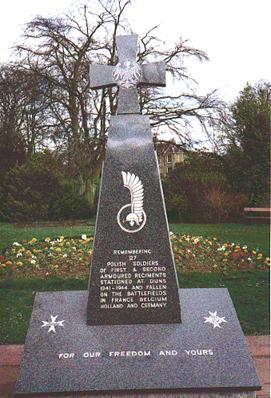 The monument with a cross at the top bears the emblem of the 1st Polish Armoured Division. Remembering 127 Polish soldiers of the first and second Armoured Regiments stationed at Duns 1941-1944 and fallen on the battlefields in France, Belgium, Holland and Germany. Down two sides of the monument are the names and ranks of the fallen. These names are listed below.